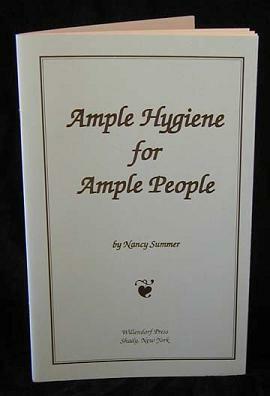 20-page booklet gives you a personal regimen that can help you feel fresh all day. It's full of tips for dealing with odor problems, fold irritations, chafing, difficulty in reaching, and more! By Nancy Summer. Willendorf Press. We are still waiting for our order for the new, revised edition to come in from the publisher. Currently, we expect to be able to take orders again around the middle of 2018. The first edition of this booklet came out in 1992. The third edition was in 2003, and was the one we had in stock. The one that will be coming in will be the fourth edition, dated 2018. The author told us that the revisions in the new edition are not major, but update some of the names of products referred to in the booklet, and generally make it more helpful for the reader.